The GPS_5_r3 is a wide base speed fin allowing excellent speed by good control when going on speed boards or XS-slalom boards in a range of 40-54cm width. Since that we did several enhancements on the profile and others by CFD simulation work and retesting on the water resulting in a wider usable AoA range and a very “robust” flow also in difficult conditions. The GPS_5 is now offered in the 3rd revision. We optimized the profile, outline and thickness distribution for less drag and robustness against stalling/ventilation. 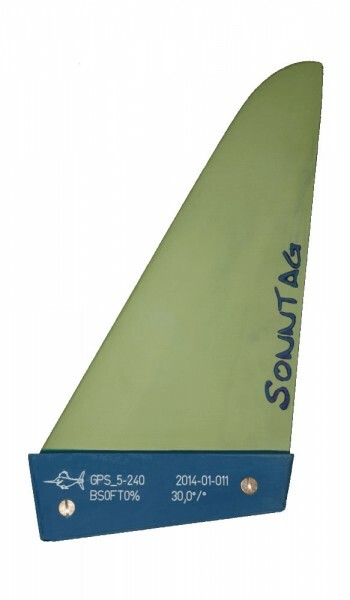 Speeds are excellent and the fin allows easy access to the board’s and sail’s performance. We are now able to produce this fin in the range of 180 to 250mm with a standard rake of 30°.